City in Palestine, opposite Taricheæ, beyond Lake Tiberias. It had an unusually strong position on the side of a mountain with a protruding spur, which gave it its name ( = "camel"). It was accessible only from the south, on which side, however, a transverse moat had been made. There was likewise on the south a high hill which served the city for a defense. Within the wall there was a well (Josephus, "B. J." iv. 1, § 1). Alexander Jaunnæus captured the fort from a certain Demetrius who ruled in that vicinity (Josephus, ib. i. 4, § 8; "Ant." xiii. 15, § 3), and from that time Gamala became a possession of the Jews (ib., ed. Niese, § 4; earlier editions have "Gabala"; the same name occurs in "B. J." i. 8, §, 4). The region surrounding Gamala, called Gamalitis in "Ant." xviii. 5, §, 1, was a territory in dispute between Herod Antipas and the Nabatæan king Aretas. 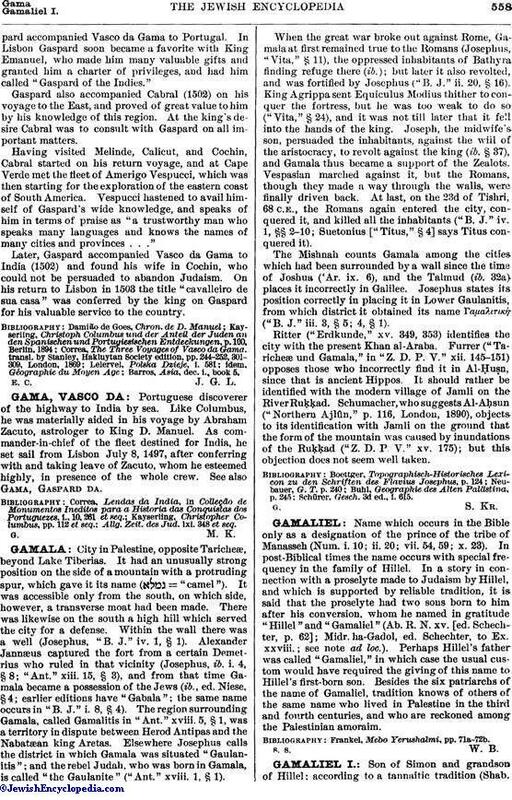 Elsewhere Josephus calls the district in which Gamala was situated "Gaulanitis"; and the rebel Judah, who was born in Gamala, is called "the Gaulanite" ("Ant." xviii. 1, §, 1). When the great war broke out against Rome, Gamala at first remained true to the Romans (Josephus, "Vita,"§ 11), the oppressed inhabitants of Bathyra finding refuge there (ib. ); but later it also revolted, and was fortified by Josephus ("B. J." ii. 20, §, 16). King Agrippa sent Equiculus Modius thither to conquer the fortress, but he was too weak to do so ("Vita," § 24), and it was not till later that it fell into the hands of the king. Joseph, the midwife's, son, persuaded the inhabitants, against the will of the aristocracy, to revolt against the king (ib. § 37), and Gamala thus became a support of the Zealots. Vespasian marched against it, but the Romans, though they made a way through the walls, were finally driven back. At last, on the 23d of Tishri, 68 C.E., the Romans again entered the city, conquered it, and killed all the inhabitants ("B. J." iv. 1, §§ 2-10; Suetonius ["Titus," § 4] says Titus conquered it). The Mishnah counts Gamala among the cities which had been surrounded by a wall since the time of Joshua ('Ar. ix. 6), and the Talmud (ib. 32a), places it incorrectly in Galilee. Josephus states its position correctly in placing it in Lower Gaulanitis, from which district it obtained its name Γαμαλιτική ("B. J." iii. 3, § 5; 4, § 1). Ritter ("Erdkunde," xv. 349, 353) identifies the city with the present Khan al-Araba. Furrer ("Taricheæ und Gamala," in "Z. D. P. V." xii. 145-151). opposes those who incorrectly find it in Al-Ḥuṣn, since that is ancient Hippos. It should rather be identified with the modern village of Jamli on the RiverRuḳḳad. Schumacher, who suggests Al-Aḥsun ("Northern Ajlûn," p. 116, London, 1890), objects. to its identification with Jamli on the ground that the form of the mountain was caused by inundations of the Ruḳḳad ("Z. D. P, V." xv. 175); but this objection does not seem well taken. Schürer, Gesch. 3d ed., i. 615.